Health Maintenance Organizations (HMOs): HMOs have their own specific networks of health care providers, including doctors, hospitals and other services, that they are affiliated with. 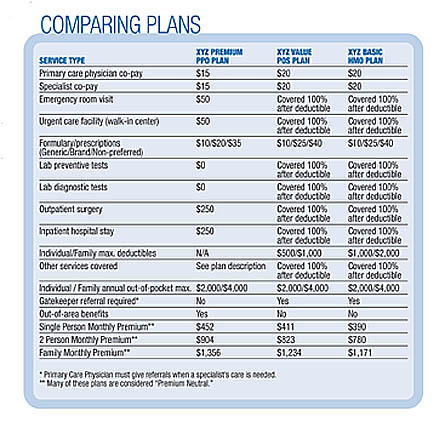 Plan members must choose from a list of these providers in order to receive full coverage. They must also pick a primary-care physician to monitor and direct their care. Preventive care is covered from childhood through the senior years. Members who go to non-network physicians or facilities usually must bear the entire costs themselves. No matter how much or how little care HMO members actually receive, they pay a fixed monthly premium and a small fee, or copay, - usually between $5 and $15 - each time they visit a doctor. In some plans, members pay nothing at all when they see an in-network doctor. It is the physician's responsibility to file claims with the HMO. 1. A Staff Model Is an HMO that hires its own doctors to practice in the plan's facilities. The physicians get a ready-made practice, with relatively fixed hours and a predictable income. 2. A Group Model is an HMO that contracts with one or more independent group practices of physicians to provide services to its enrollees ? often on an exclusive basis. This exclusivity means the physicians' group can only treat that plan's members. 3. A Network Model is similar to a group model. This type of HMO contracts with one or more independent group practices of physicians to provide services to its enrollees. But unlike the group model, this is a non-exclusive arrangement and physicians can treat patients who are not members of the plan. 4. An Independent Practice Association (IPA) is sometimes called an "HMO without walls." This type of HMO contracts with individual physicians to care for plan members in their own private offices. Physicians are free to contract with more than one plan and usually provide care on a fee-for-service basis, as well. 5. The Point-Of-Service Plan (POS) also is called an "open HMO." These increasingly popular plans are similar to IPAs. POS members have the option of going to doctors who are not part of the plan's network. The catch is that there's a significant financial penalty that includes paying a deductible and a higher co-payment, as well as getting a lower reimbursement rate. For example, if a woman sees an in-network primary-care physician, she might only pay $10 per visit. But if she goes to a doctor outside the network for care, she may have to foot up to 30 percent of the bill, and her deductible could run as high as $500 to $1,000. There are so many POS plans that we have differentiated them from HMOs in the report card data. Preferred Provider Organizations (PPOs) are a compromise between the fee-for-service system and HMOs. They are growing in number. Like HMOs, these plans have networks of physicians and hospitals, and plan members pay a monthly premium and small charges (co-payments) at the time service is received. However, PPOs will pay a portion of the costs incurred if a member chooses a doctor or facility outside of the plan's network. For instance, plan members might receive from 80 to 100 percent reimbursement for treatment by a PPO provider, but only 60 to 70 percent reimbursement for treatment by a physician outside the network. PPOs may require doctors to obtain the plan's approval before sending patients to the hospital, but they don't require members to choose a primary-care physician. People who join a basic PPO can go to any doctor in the network whenever they want care. This doctor could be a family doctor, internist, pediatrician or obstetrician/gynecologist. This physician either treats you or refers you to a specialist when necessary. Note: Many of these plans are considered "Premium Neutral." This means that you can ask for a two-, three- or a four-tier plan price structure. However, no matter which plan you choose ? Single/Family or Single/Two-Person/Family ? the monthly billing total will always be the same. The insurance companies' underwriters figure the math so that the insurance company gets the same premium they want despite which plan you choose. Editor's note: Definitions of health care plans above were adapted from information produced by the Agency for Health Care Policy and Research, Rockville, MD. Motor Age thanks the agency for their assistance. What would you think if you saw this sign posted in the window of a business? It would get your attention and maybe even a few laughs. Unfortunately, the topic of health care is no laughing matter. Health care benefits are becoming increasingly important in the struggle to keep good employees. Are you aware of all your options? It seems like things were so much simpler just a few years ago. Regarding health care, at one time most businesses had the same insurance company. You remember: the old 80/20 indemnity plans with the quarterly deductible? The patient paid 20 percent of the office visit plus the quarterly deductible, and the insurance provider paid the remaining 80 percent. I don't know if it was good or bad, but it sure seemed a lot simpler. Like most business owners today, I find myself spending large amounts of time shopping for health care plans. In the past, several insurance companies have told me that our company pays reasonable rates considering the volatile market. But we have always shopped annually for health care insurance. In a sense, we have always tried to stay on top of it. In addition, we enlist the help of a broker who obtains quotes form several different companies each year. Even so, every year I am shocked over our renewal rates. In the past, they have gone from chunky 12 percent to whopping 30 percent increases. These increases are tough to stomach for both the employer and the employees. Currently we pay 50 percent of our employee's health care benefit. Even so, how do you tell your employees every year that their weekly pay just took another $20 hit? How will the business cover a $5,200 annual increase? Let me tell you, it's just not easy. In the end, it comes down to several key issues. At first blush, the health care market can seem like a labyrinth of nightmares. There are many companies to choose from and each company has a variety of plans and configurations. One company will offer a two-tier rate as Single vs. Family coverages. Other companies will offer three- or four-tier plans that include the two-person households (Single Plus One). Once you know the rate, the business and employees can figure their annual costs. That's the easy part. The hard part is choosing a plan everyone can best live with. You see, it's all a matter of how much you want to pay in addition to your monthly premium. Or as the insurance industry would say: How much do you want to co-insure? Can you live with a plan that requires referrals to see specialists? Do you mind having to go through a gatekeeper (primary care physician) for specialist referrals? Can you live with a $20 co-pay? Will your family have to go to the hospital this year? If so, can you handle the first $2,000 out-of-pocket expenses? 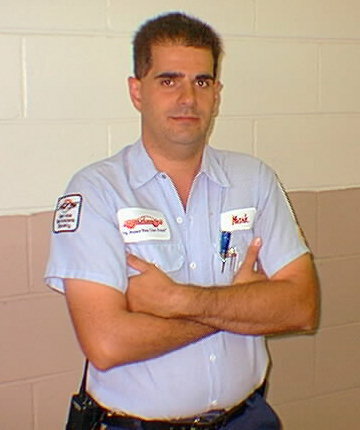 Do you and/or your employees require many maintenance prescriptions on a regular basis? Can you handle a formulary (drug) benefit of 10/25/40? It's a lot to think about. Don't be surprised if the insurance company makes you fill out a questionnaire concerning details of how you pay your insurance. A common question on this form is what percentage your business pays toward employee health care. Typically the insurance companies will mandate that the business pay at least half of the family plan's premiums and a third or more of the single plan's premiums. Why would the insurance company care what portion your business pays? It all has to do with the insurance underwriters and how they determine risk ratios. A business that pays for half of the health care benefit will tend to have a better ratio of healthy subscribers. The logic is that more people will sign up because a larger amount is employer paid, and that means more healthy people in the plan. But when the employee has to pay more, those who know they are more likely to need health care coverage will tend to sign up more readily. This is because they have no choice but to purchase the coverage. This ends up costing the insurance company more money. Other questions on the questionnaire may ask about the number of "eligible" employees that are currently not on the plan. This normally means other full-time employees who are obtaining health care elsewhere, such as through their spouse's employment. Again, the insurance company wants to know about possible future risk. The insurance company knows that they may be on the hook for providing coverage if an employee's spouse suddenly loses his or her job or heath care. You should be aware of a new tactic that some health insurers are trying this year. When we received our recent health care renewal, our main concern was both the coverage and the rates for single and family. We have had the single/family two-tier rate for many years now. However, the insurance company decided to slip in an additional rate this year. Even my health care broker had never heard of it. After choosing our renewal plan we were stunned when we received our first bill. Although we had selected a two-tier plan, we actually got a three-tier plan. How can they do that? Here's how: For the past several years my parents have had Medicare Part A, as well as the company's health insurance plan. Suddenly, in this year's renewal, our insurance company had decided to charge a higher rate for my parents. That's right: a premium that is greater than the normal single or family rate. It comes down to about an additional $45 for each of them, adding $90 a month to our monthly statement. When I called the representative at the insurance company, he directed me back to my rate quote sheet. Sure enough, down at the bottom, was a statement that said that we had two "Medicare Active Employees." On a subsequent conference call, my insurance broker and I challenged the account representative over this new unannounced rate structure. The account representative had a few interesting explanations. He said that in the past, overall group rates were higher to make up for the "older high-risk" members on Medicare. The insurance company had decided to spread out the risk factor in a more realistic way. Another words, give more premium burden to the Medicare-active members. However, federal law dictates that Medicare is the primary provider when a Medicare active participant is on a plan with 20 members or less. That being said, why would the insurance company charge more if Medicare were the primary responsible provider? The representative's answer was interesting: He said that a person who is on Medicare and still on a private plan is considered a "red flag" with the underwriters. Why? Because underwriting presumes that member must have a high-risk health factor if they need both the Medicare and a private plan. Needless to say, we did not get very far in the discussion. Our broker believes that they quietly pushed this new three-tier structure through in hopes of catching most subscribers off-guard. It would have been nice for them to bring this change to our attention before we chose the renewal plan. Then we would have had a truer picture of the coming year's cost. Ask your insurance provider how they pay the doctors within the plans. Most plans now pay each doctor a reduced "Fee For Service." However, some HMO plans pay doctors via "Capitation Methodology," in which the doctors have already been allotted payment in advance. The insurance company sets up a large pool of funds for the doctors. In essence, the doctors have been paid without seeing any patients. Each time a patient comes in for service, the doctors are using up the revenue they have already been allotted. In addition, the insurance companies can offer incentives to doctors that stay within the pool amount for the year. Doctors that overutilize care with too many specialists referrals may not receive the dividend payment. Some patients and physicians argue that this method reduces the utilization of services and even compromises patient care. Others counter that the plan is fair and unbiased. As a business owner, it is incumbent on you to check out all of your choices in health care plans. You owe it to your employees, as well as yourself. You are assuming a large part of the cost of this coverage. Choosing the right company and plan may make a large difference in your costs and in the value of the benefits themselves. If you belong to an association, check on whether health care is offered through that organization. If you are not an automotive association member, visit the Internet site of the U.S. Small Business Administration (SBA) at www.sba.gov. Search for AHP or Association Health Plans. These plans have been proposed in Congress to allow groups of small businesses to band together to buy health insurance. According to SBA, some of the projections are that businesses could save as much as 13 percent on their coverage by taking advantage of AHPs. The U.S. House of Representatives passed the legislation in 2003, and the Senate is due to take up the matter next. Your best ally in this endeavor is information. Sound familiar? It truly pays to know how the various plans work and what they have to offer. Get all the information you can on each plan and if possible, pit them against each other. Everything is negotiable. You'll be glad you did your homework.